I’m picky when it comes to perfume. Since graduating from Bath and Body Work’s Coconut Lime Verbena eons ago, I’ve only ever had two or three perfumes in my lineup. I don’t try new fragrance, I don’t buy new fragrance. It’s been boring. 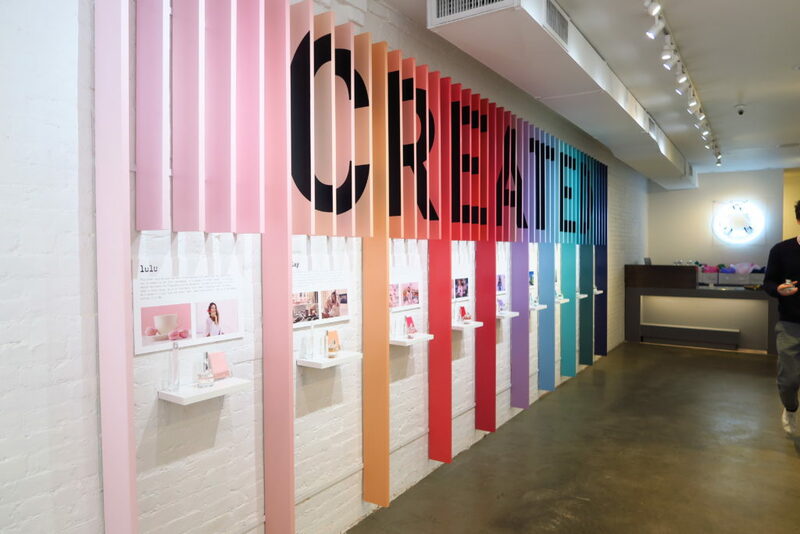 So, imagine my delight at being shaken out of my perfume rut in a big way at Olfactory NYC. 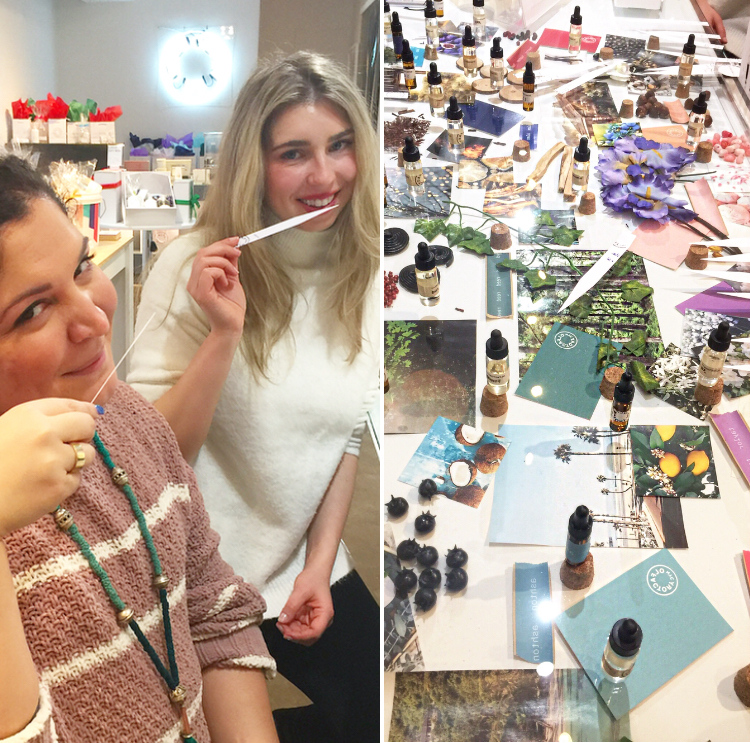 For the uninitiated, Olfactory is not only a killer play on words, but an oasis of fragrance in the heart of the bustling New York City. The studio’s clean design with bright bursts of color feels refreshing as you walk in, preparing you for a new kind of beauty experience. While you can always pop in and purchase ready-made perfumes, the best way to get a sense of Olfactory’s philosophy is to create a custom fragrance. Their attitude towards perfume buying is that it should be a personal experience without fuss, pretention, or fancy labels. They use the highest quality ingredients but keep the packaging minimal, which lowers the cost to the customer while delivering amazing fragrances. One of the founders, Joseph, was there to guide the Around the World Beauty team through our fragrance experience. First, he took us through the nine main “base scents” that we would be building from. Each of the base scents can be worn on their own, but if you’re making a custom perfume, they’re your starting point. The fragrance testers are all marked with each base scent’s name, which was incredibly helpful. Not only did I love the base scents’ fun names, the range was really solid and offered something for everyone. When you’ve narrowed down your favorite base scents to two or three options, you head over to the Custom Corner where you can add different accords to the base. The accords are additional fragrance notes that take your base scent to the next level. Joseph took us through each of our base scents with the different accords added, and it was amazing to me how some of the accords completely changed the fragrance profile of the bases. We had so much fun tinkering around with different combinations, and there was no pressure or rush to decide. Once you’ve made your final decision though, your perfume is mixed and bottled right there. As a final touch to your bespoke fragrance, you get to choose a color for the label and your fragrance’s name, which is stamped on. 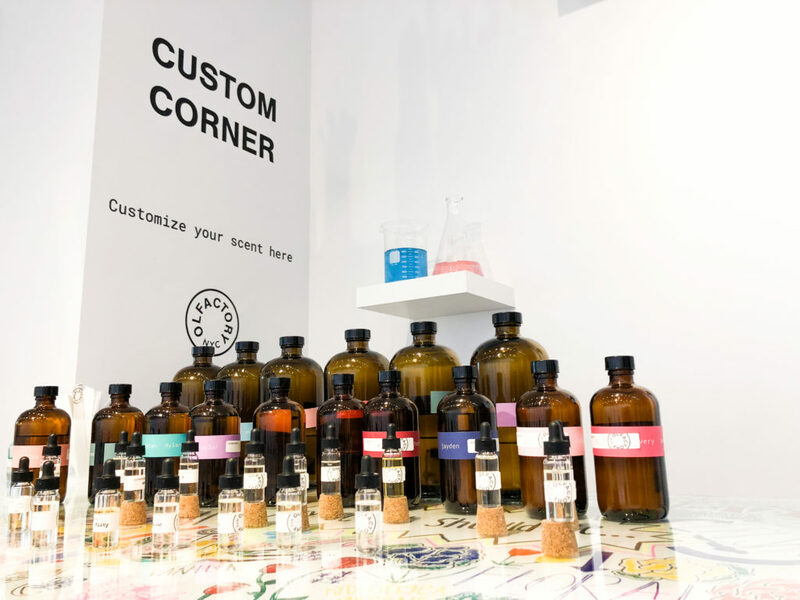 Also, no need to worry about writing down your custom combination: Olfactory keeps a record of it so as soon as you run out, you can order a fresh bottle (in person or online). I was surprised by how I ended up gravitating towards things I wouldn’t ordinarily choose for myself. I fell in love with the base scent “Hunter,” which is a heavenly warming blend of vanilla, cedarwood, and ambrette. I could take a bath in it! For my accord, I chose lemon and smoky tea, which helped me settle on the name for my blend: “Tea Time.” I find myself reaching for it and wanting to wear it constantly – it’s my new obsession! I love how it starts off fresh and zesty, full of lemon, then settles into a really sweet, warming fragrance with that delicious hint of smoky tea. I will absolutely be getting a refill once it’s gone. I can’t recommend Olfactory enough if you’re looking for a unique New York experience for yourself or someone you love. 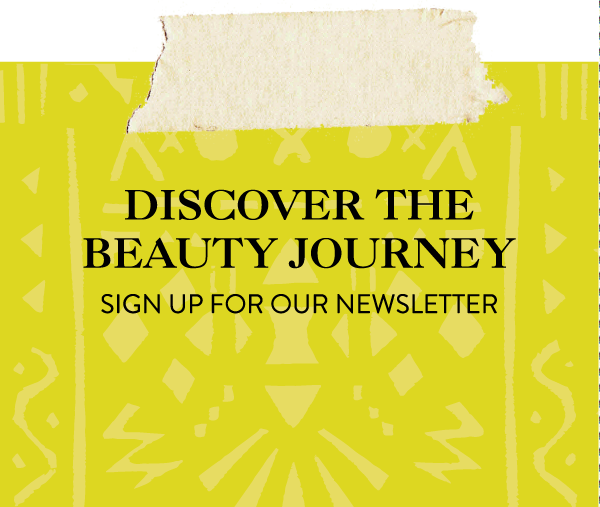 It’s such an excellent beauty gift because it offers both a unique beauty experience, and a bespoke product to take home. Not located in NYC but still want a custom Olfactory scent? No problem! Olfactory offers sets of sample sizes that you can order, play with, and decide on what combinations of base scents and accords you prefer. Their full range of base scents, candles, and body fragrances is also available online. Olfactory is located at 281 Mott Street in New York City. 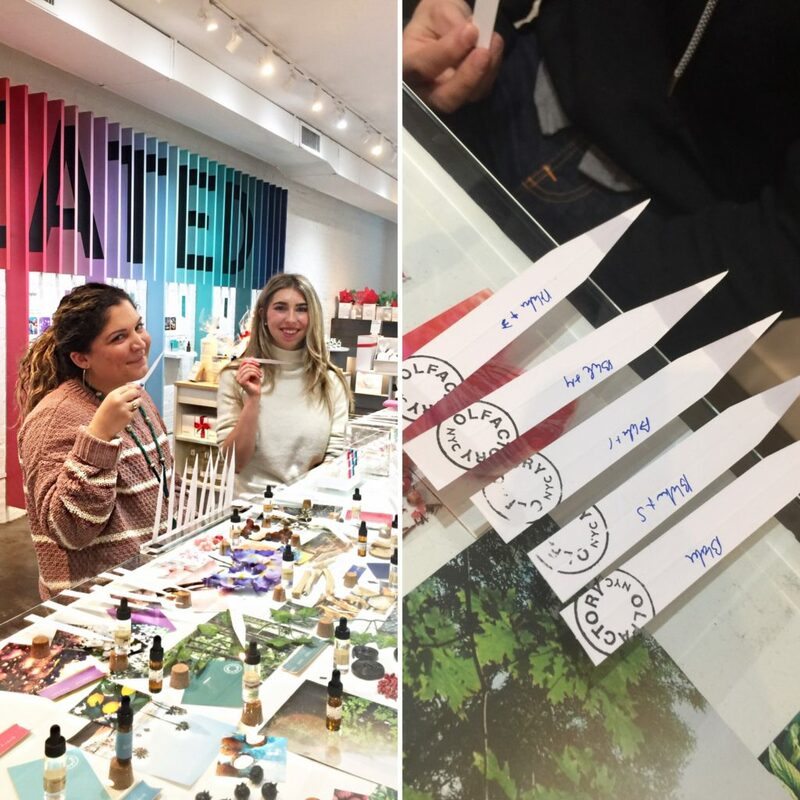 Many thanks to Olfactory, and special thanks to Joseph for guiding us through our fragrance experience! For more New York City beauty experiences, check out our New York Beauty Walking Tour!